A leader in networked access control systems, Fortress’ technology helps create safer workplaces where employees in industrial environments are safeguarded from injury, equipment is protected from damage and overall productivity is enhanced. The company’s products ensure that actions and events are undertaken in a predetermined sequence, ensuring a safe working environment. Deebar has exclusively represented Fortress Interlocks for over 35 years in Africa and offer interlocking support for an extremely wide range of industrial applications, including power generation and distribution, iron and steel, automotive manufacturing, food and beverage, recycling, building and construction, robotics and palletisers. The extensive product range, available together with experience, means that Fortress can provide solutions for all safeguarding applications. As the world races towards billions of devices connected to the Internet by 2020, Industrie 4.0 presents a huge challenge to manufacturers. Collaborative robots and the automation of tasks previously carried out by people, is reducing the need for traditional machine guarding while increasing the need for smart interlocks. Fortress prides itself on maintaining mechanical strength and reliability in its products, which have a reputation as being among the strongest on the market. More recently it has built-in additional functionality to help customers better manage their processes. As the importance of data increases, it is becoming a requirement for products to provide feedback through extensive, potentially global, data networks. The company has completed various installations utilising its network-enabled gate switches, designed to operate on safety networks. These products are easy to configure and install and provide additional operational feedback, as well as carrying out their safety functions. Manufacturing plants are notorious for their dusty, arduous environments and high vibration levels from machinery. This can play havoc with traditional safety interlocks, often causing tripping faults. To overcome these problems, Fortress Interlocks has developed its Profi-enabled amGardpro interlock gate switch with built-in machine control technology, built to withstand the most strenuous conditions. With a locking force of 10 000 N, the Profi-enabled switch eliminates virtually all nuisance tripping faults, making amGardpro one of the most robust networked safety interlocks on the market. Profinet is an advanced industrial Ethernet system for transporting data in real-time between control devices (such as PLCs) and field devices (such as safety gate switches). Using Profi-enabled amGardpro gate switches, a customer of Fortress, specialising in the manufacture of roof tiles, was able to reduce the wiring for each interlock unit, significantly reducing design, engineering, commissioning and maintenance costs, and virtually eliminating tripping faults. The amGardpro is designed to protect personnel from inadvertent machine restart. Every gate switch at the tile manufacturer is fitted with a safety key which must be taken by any worker who enters the guarded machinery. The machinery cannot be restarted until the safety key has been returned to its original position outside the hazardous area. If access for multiple personnel is required, the interlock is fitted with a lock-out clip, enabling operators to attach a padlock to the gate switch for lock-out tag-out purposes. 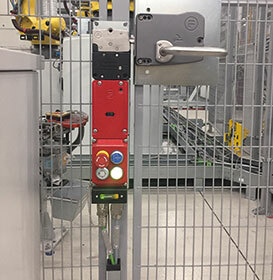 Connecting Fortress safety gate switches to a Profinet network, provided an unprecedented level of diagnostic coverage for the tile manufacturer. Engineers could use standard Internet browsers to access diagnostic displays which provided accurate topology views of the network for rapid fault location. This form of fault detection drastically decreased the level of production downtime, while allowing authorised personnel to access network displays remotely, meant engineers could diagnose system faults without being on site. The amGardpro Profinet switches have helped the roof tile manufacturer to make significant improvements in the way the plant is controlled, monitored and managed. As industry evolves, Fortress’ view remains unchanged – protect people and productivity in this digital age.